&amp;lt;div style="text-align:center"&amp;gt;&amp;lt;img src="http://ti2.auctiva.com/sw/java.gif" border="0"&amp;gt;&amp;lt;br&amp;gt;&amp;lt;table align="center"&amp;gt;&amp;lt;tr&amp;gt;&amp;lt;td&amp;gt;&amp;lt;a style="text-decoration:none" href="http://emporium.auctiva.com/grumpaschest" target="_blank"&amp;gt;&amp;lt;img src="http://ti2.auctiva.com/sw/browse2.gif" border="0"&amp;gt;&amp;lt;/a&amp;gt;&amp;lt;/td&amp;gt;&amp;lt;td height="21px" valign="middle" align="center"&amp;gt;&amp;lt;font face="arial" size="2"&amp;gt;&amp;lt;b&amp;gt;&amp;lt;a href="http://emporium.auctiva.com/grumpaschest" target="_blank"&amp;gt;grumpaschest&amp;lt;/a&amp;gt; Store&amp;lt;/b&amp;gt;&amp;lt;/font&amp;gt;&amp;lt;/td&amp;gt;&amp;lt;/tr&amp;gt;&amp;lt;/table&amp;gt;&amp;lt;/div&amp;gt; &amp;lt;img src="http://ti2.auctiva.com/web/aswCredit.gif" border="0"&amp;gt;&amp;lt;br&amp;gt;&amp;lt;a href="http://www.auctiva.com/?how=scLnk1" target="_blank"&amp;gt;&amp;lt;img src="http://ti2.auctiva.com/images/sc1line1.gif" border="0"&amp;gt;&amp;lt;/a&amp;gt; Normal 0 false false false EN-US X-NONE X-NONE MicrosoftInternetExplorer4 Own a Piece of History, Beautiful 1951 Bentley Mark VI 1 of only 180 produced I am not a Car dealer or broker and not really even a car enthusiast of much. I am just a regular Joe Grumpa that lives on a small fixed income that occasionally finds some very rare and good finds and this is just one of those finds. I just recently found this almost lost and forgotten Mark VI. Second owner had purchased this beauty well over thirty years ago and drove it very little. For the past twenty five plus years this car had only come out of the garage to play three times and that was for local parades. She has only registers 40781 on the odometer. I believe, and would even put a wager on it, that it is actual and original miles on her. It appears the spare tire is the original. Paint looks to be original except maybe the cream color; I am not sure if cream was added later over the burgundy. Interior is beautiful. All leather with no rips or tears in any of the seats. Could use headliner replacement and perhaps new carpeting. All of the wood is in very good shape, dash wood, sun roof wood trim all very nice. Chrome all very nice, a few very minor paint nicks and scratches but then it is almost 65 years old! She has a fresh tune-up, oil change and a new battery. I was told that the radiator was rebuilt three years ago (for the last parade she was in) and it seems to be working well. If you plan on going on a road trip I would suggest the tires be checked. They appear to be in good shape with lots of tread but they look pretty old. She is currently tagged and registered in the state of Oregon until June of 2016. From 1946 to 1952 there were only a total of 5,208 Mark VI produced. Of that 5,208 there were only 180 4-door saloon models with the updated and more powerful 4.6 straight six with the 4-speed transmission. That makes this car very rare! How many out of 180 produced are still alive today? I saved this one from who knows what and now she needs a good, loving home for another sixty years or more. Would consider a trade for maybe even a Ferrari LOL. Just thought I would throw that out there. If you have any questions, give me a call 1-530-357-2982. Serious and voice calls only; ask for Joe or The GrumpaCheck out these YouTube Videos https://www.youtube.com/watch?v=W3xDlDFRizMAND https://www.youtube.com/watch?v=Y_KPyH3_Yq4 Note: FREE SHIPPING AT MY ASKING PRICE TO THE FOLLOWING STATES: ALL OF CALIFORNIA, ARIZONA, NEVADA, WASHINGTON and OREGON. Free Shipping DOES NOT apply to accepted "Best Offer" but will contribute $500 towards shipping costs.Knowing that California has high vehicle registration and title fee's I will pay for new registration and title fee's with my full asking price and up to half of cost with offer price depending on your offer. Thanks for checking it out. Great Shape. Used Daily. Runs Like A Charm. I baby it and so will you. Great Image. Drive like royalty. 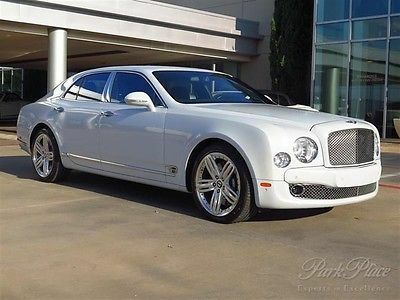 2012 Bentley Mulsanne Vital Information Year Make Model Mileage Engine 2012 Bentley Mulsanne 7,091 6.75L Twin-Turbocharged V8 Engine Exterior Interior Stock# VIN Glacier White Solid Shortbread B2849 SCBBB7ZH3CC017093 view window sticker Description 2012 Bentley Mulsanne 2012 Bentley Mulsanne We are proud to offer this PRISTINE 2012 Bentley Mulsanne for sale. This Mulsanne is breathtaking and looks amazing both inside and out. The leather interior is in IMMACULATE CONDITION as well as the exterior. The Mulsanne offers a comfortable ride and a LUXURIOUS CABIN. Carfax is CERTIFIED showing 2 previous owners. We offer long term financing for this vehicle. 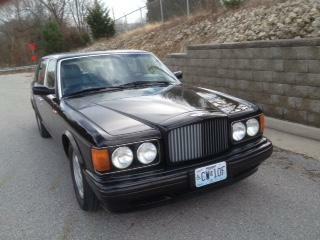 It has only 7,091 SUPER LOW MILES and is STUNNING BOTH INSIDE AND OUT. Options & Features:NavigationBackup CameraVeneer Picnic TablesVeneer TrimHeated Front SeatsVeneer Trim Steering WheelDual Zone Automatic Climate ControlPower Rear Side SunshadesPower Rear SunshadePower Rear SeatsPark Distance ControlPower Trunk Open/CloseIpod IntegrationPolished WheelsFor more information please call us at 949-791-2167. We look forward to speaking with you. Secure Online Credit Application Applying for a vehicle loan online is one of the quickest and easiest application methods. Our secure online application form is easy to complete, all you need are a few personal and employment details. Get started now. Shipping PRIVATE COLLECTION MOTORS INC proudly recommends MoveCars.com for your vehicle transportation needs. MoveCars.com contains a directory of transportation providers servicing the US, Canada and beyond. Get your Free Quotes Now at MoveCars.com! View more info » At Private Collection Motors Inc, we specialize in the Wholesale division of the EXOTIC and LUXURY Automobile Market and mainly Wholesale-Trade amongst majority of the premier Retail Luxury Automobile dealers within the United States and a few in the Far East. In the 1st quarter of 2011 we decided to add a RETAIL SHOWROOM to our Wholesale Business Model. In the Wholesale World the key ingredient to success is volume of sales and obviously much less profit margin. With years of Experience in the business, we take pride and will keep our promise to provide you with the best value, by hand picking each and every vehicle we provide for sale. Please Contact us for a free copy of the Car Fax Report, additional pictures or if you have any other questions. OUR RETAIL SHOWROOM HOURS ARE MONDAY-FRIDAY 10AM-7PM (PST) SATURDAY & SUNDAY 10AM-6PM. Due to our quick turnover, please contact us to check the availability of any vehicle by phone at 949-791-2167. You can also reach us by email atprivatecollectionmotorsinc@gmail.com. As a part of our services to our customers, we will accept vehiclet rades, provide competative financing and creative leasing, can assist with the transport of any vehicle from our inventory to a nearby Factory Authorized Service Facility for a Pre Purchase Inspection and assist you with enclosed shipping to any destination in the world. We offer EXTENDED WARRANTY, CREATIVE LONG TERM FINANCING and LEASING for transactions within the United States on selected vehicles and credit criteria. We understand that purchase of any Exotic or Luxury type of vehicle highlights a celebrated achievement in one's life; it is our goal as a team to make that experience a positive and memorable one for all of our customers. On that note, we are looking forward to doing business with you and to establish a relationship. Ad created by eCarList.com. Call 214-722-8200 to find out how eCarList can service your dealership. 2013 Bentley Mulsanne Vital Information Year: 2013 Make: Bentley Model: Mulsanne Mileage: 51,200 Engine: 6.75L Twin-Turbocharged V8 Engine Exterior: Ice Metallic Interior: Beluga Stock#: MB6324B VIN: SCBBB7ZH4DC018092 Carfax Highlights View Carfax Report Not all accidents or other issues are reported to CARFAX. The number of owners is estimated. See the full CARFAX Report for additional information and glossary of terms. Carfax Highlights No Accidents / Damage Reported to CARFAXNo Airbag Deployment Reported to CARFAXVehicle Qualifies for the CARFAX Buyback GuaranteeNo Structural/Frame Damage Reported to CARFAXNo Manufacturer Recalls Reported to CARFAXNo Indication of an Odometer RollbackCARFAX 1-OwnerNo Total Loss Reported to CARFAX Photos Description 2013 Bentley Mulsanne Park Place Premier Collection is pleased to be currently offering this 2013 Bentley Mulsanne with 51,200 miles.Park Place Bentley DallasOne OwnerBentley Certified This is a Certified Pre-Owned Bentley with benefits that include: CARFAX™ VEHICLE HISTORY REPORT:Your Authorized Bentley Retailer has reviewed your CARFAX™ Vehicle History Report and confirmed an authenticated odometer reading, accident repair report, and a free and clear title. 154 POINT INSPECTION:Your Authorized Bentley Retailer has reviewed the Bentley Pre-Owned Motor Car Coachwork and Preparation Checklist with you and that your vehicle has met the highest quality and standards required to be deemed a Bentley Certified Pre-Owned Vehicle. LIMITED WARRANTY & EXTENDED SERVICE PLAN:Your Authorized Bentley Retailer has reviewed the Bentley Certified Pre-Owned Limited Warranty or Extended Service Plan. COMPREHENSIVE ROADSIDE ASSISTANCE PACKAGE:Your Authorized Bentley Retailer will explain the full benefits of the 24-Hour Bentley Roadside Assistance Program. ZERO DEDUCTIBLE:Your Authorized Bentley Retailer will explain how the Bentley Certified Pre-Owned Warranty carries a zero deductible. NO MILEAGE RESTRICTIONS:Your Authorized Bentley Retailer will explain that the Bentley Certified Pre-Owned Warranty and Extended Service Plans expire based on months, not mileage. BENTLEY OWNER’S MAGAZINE SUBSCRIPTION:With the purchase of your Bentley Certified Pre-Owned Warranty you will be entitled to a complementary one-year subscription to the Bentley Owner's Magazine. Original MSRP $351,295 This Bentley includes: REAR VIEW CAMERA Back-Up Camera VENEERED GEAR LEVER CHROMED RADIATOR SHELL W/BRIGHT STAINLESS STEEL MATRIX GRILLE ADAPTIVE CRUISE CONTROL Cruise Control BENTLEY WING BADGE TO WAISTRAILS FRONT/REAR SEAT VENTILATION Cooled Rear Seat(s) Heated Rear Seat(s) Heated Front Seat(s) Cooled Front Seat(s) CONTRAST STITCHING AMBIENT INTERIOR MOOD LIGHTING NAIM FOR BENTLEY PREMIUM AUDIO SYSTEM Premium Sound System MULLINER DRIVING SPEC W/ALTERNATIVE WHEEL Aluminum Wheels VENEERED IPOD DRAWER Ice Paint Clean, Well Maintained, In Excellent Condition Clean CarFax For additional information, please call me Beth Schneider at 866-865-9488 bschneider@parkplace.com Please Note: This vehicle is also offered for sale at our dealership and is being advertised at various websites. We reserve the option to end the auction any time or when the vehicle is sold. I strongly recommend that you contact me by email bschneider@parkplace.com or call me at 405.413.3349 BEFORE selecting the “Buy it Now” feature to make sure the vehicle is still available and there are no pending contracts. Thank you. CarFax Vehicle History is Clear Trade-Ins Accepted Financing Available The Park Place Premier Collection is one of the largest luxury franchise dealerships in the nation, representing the Bentley, Jaguar, McLaren, Maserati and Rolls-Royce brands. We take great care in keeping our listings up to date; however our inventory changes daily and not all inventory is online. Please call us if you have a specific interest in a vehicle that you do not see posted. Our goal is to provide you with an excellent vehicle purchase and ownership experience. We look forward to your call. *Note - For third party subscriptions or services, please contact the dealer for more information. * With a CARFAX Buyback guarantee from Park Place Premier Collection, you'll drive away with more than just a great Bentley Mulsanne. You'll drive away with peace of mind. The best part about this well-maintained vehicle is that it is a CARFAX one-owner vehicle. Certified Pre-Owned means certified peace of mind. Put performance, safety, beauty, sophistication and all the right amenities into a car, and here it is! Now you can own luxury without the luxury price tag! Added comfort with contemporary style is the leather interior to heighten the quality and craftsmanship for the Bentley Mulsanne Let's be honest, not everyone wants to set a course blindly into the dark. For those of us that don't, there are vehicles like this with stellar navigation systems. 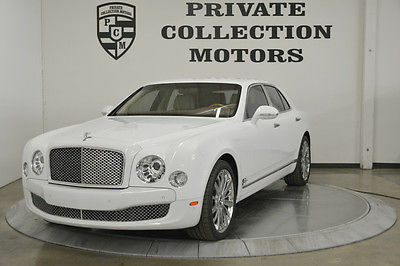 More information about the 2013 Bentley Mulsanne: The Mulsanne is aimed at buyers looking for a driver's car at the high end of the automotive spectrum--a place usually reserved for exotics and chauffeur-driven luxury cars. 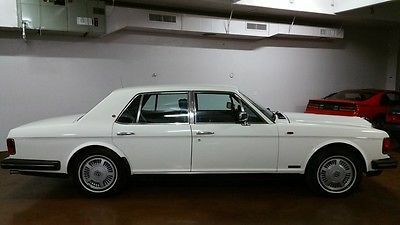 It features classic Bentley looks over a handsome design, and it's the first "big Bentley" built since the company was purchased by Volkswagen, so it utilizes many off-the-shelf components from cars like the Audi A8. With its high-end luxury and excellent overall performance, the Mulsanne is fit to take on offerings from Maybach, Rolls-Royce and BMW. Strengths of this model include incredible interior, sophisticated styling with a classic Bentley look, and Ultimate luxury and excellent performance Contact Us Dealer Contact Park Place Premier Collection Beth Schneider bschneider@parkplace.com 405.413.3349 Carfax Ask Dealer A Question If you have a question, please call or complete the form below for a quick response. 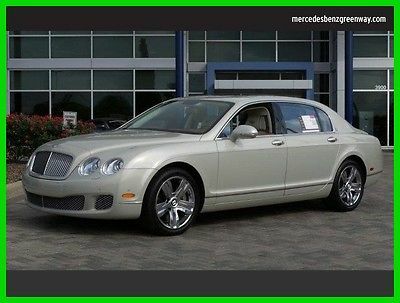 Name Email Phone Question(s) Optional Equipment ADAPTIVE CRUISE CONTROL[GRA8T3]Cost: $3670.00Details:Cruise ControlCHROMED RADIATOR SHELL W/BRIGHT STAINLESS STEEL MATRIX GRILLE[KUG6KC]Cost: $1670.00BENTLEY WING BADGE TO WAISTRAILS[EMINR4]Cost: $1670.00VENEERED IPOD DRAWER[INT4N2]Cost: $585.00 MULLINER DRIVING SPEC W/ALTERNATIVE WHEEL[PS3]Cost: $19215.00Details:Aluminum WheelsNAIM FOR BENTLEY PREMIUM AUDIO SYSTEM[LSE9VN]Cost: $7565.00Details:Premium Sound SystemVENEERED GEAR LEVER[SAG6Q8]Cost: $655.00CONTRAST STITCHING[STC]Cost: $1865.00 FRONT/REAR SEAT VENTILATION[KMS4D2]Cost: $3365.00Details:Cooled Rear Seat(s)Heated Rear Seat(s)Heated Front Seat(s)Cooled Front Seat(s)AMBIENT INTERIOR MOOD LIGHTING[LCPQQ1]Cost: $440.00REAR VIEW CAMERA[EPH7X8]Cost: $1760.00Details:Back-Up Camera Standard Equipment ENTERTAINMENT Bluetooth connectivity Infotainment centralized control system -inc: remote control AM/FM stereo w/6-disc CD changer -inc: (14) speakers, 6-channel amplifier, iPod/MP3 connections, 20GB hard drive music storage EXTERIOR Acoustic laminated windows Pwr latching soft-close doors 20" Mulsanne painted alloy wheels Xenon headlights w/chrome bezels Color-keyed pwr mirrors w/turn signal indicators Tire inflation kit LED tail lights Variable speed intermittent windshield wipers INTERIOR Front/rear floor mats Keyless entry & ignition w/engine start/stop button Steering column mounted gear shift paddles Pwr windows Leather pwr front bucket seats -inc: 12-way pwr seats Navigation system Front map lights Leather trim on seat facings & doors Cruise control Rear window defogger Single-tone hide trimmed 4-spoke steering wheel 4-zone auto climate control Hydraulic brake assist Electrochromic rearview mirror 40/20/40 pwr rear leather seats -inc: 8-way pwr rear outboard seats Adjustable steering wheel Interior wood trim MECHANICAL Twin stainless steel oval tail pipes 8-speed automatic transmission w/paddle shifters 6.75L twin-turbocharged V8 engine Pwr Steering Front & rear independent air suspension w/continuously variable damping Rear wheel drive PROCESSING-OTHER ** PRELIMINARY STANDARD EQUIPMENT ** SAFETY Front & rear 3-point seat belts w/pre-tensioners Driver & front passenger frontal airbags w/occupant sensor Hill hold control Parking distance control Front & rear side mounted airbags Front & rear head & side curtain airbags Traction control system 4-wheel antilock braking system (ABS) Electronic stability program (ESP) Secure Online Credit Application Applying for a vehicle loan online is one of the quickest and easiest application methods. Our secure online application form is easy to complete, all you need are a few personal and employment details. Get started now. Other Vehicles Currently Available ROLLS-ROYCE MOTOR CARS DALLAS Rolls-Royce drivers demand nothing less than the best, both from their vehicle and from their dealership. As the only authorized dealer of new and pre-owned Rolls-Royce vehicles in the Dallas/Fort Worth Metroplex, Park Place takes its commitment to Rolls-Royce-caliber service very seriously. At Rolls-Royce Motor Cars Dallas, we have established a reputation for award-winning excellence that spans over 20 years. It starts with our experienced and highly-trained sales associates, who will give you all the expert advice and personal attention you deserve. And it continues with our commitment to superior repair work, with Rolls-Royce certified technicians using the latest in high-tech service equipment, ensuring that you always receive the best, most reliable service possible. Visit Rolls-Royce Motor Cars Dallas today, and see for yourself how Park Place is making purchasing a world-class vehicle an equally world-class experience. Terms & Conditions Payment & Financing You must be PRE-APPROVED BEFORE making a binding bid or Buy It Now purchase! Contact us prior to bidding to arrange financing if needed. We utilize multiple lenders and guarantee the best possible rates nationwide. PLEASE NOTE: We do not accept E-Loan payments! We accept Certified and Cashiers Checks and Funding Transfers in $US only. All funding or paperwork must be received as soon as possible and within no more than 5 days of auction closure or we reserve the right to re-list or sell to any other qualified buyer. Winning Bidder must confirm his winning bid with a 10% Refundable Deposit within 48 hours of auction end. Balance of Purchase Price is due to Seller within 5 days of the end of the auction. Taxes and Fees Texas buyers pay 6.25% sales tax. Buyers outside of Texas are responsible for applicable sales taxes in their home state. If necessary these taxes will be collected at time of contracting. All sales are subject to Texas VIT Tax based at 0.002487 of purchase price. For example, the VIT for a $10,000 purchase is $24.87 ($10,000.00 x .002487). All sales are subject to $155.00 document fees. Buyer will be responsible for his own Licensing Requirements in State of residence. General Terms Buyer can inspect vehicle at our premises 6 days a week, Monday through Saturday. Send your representative early to be sure you don't miss this one! To serve you best, we prefer to show vehicles by appointment. Unless stated otherwise all vehicles are sold 'As Is', that is to say with No Warranty. Remaining manufacturers coverage may exist or a service contract may be available. Assure peace of mind with service contract coverage on your purchase up to 100,000 miles! Seller reserves the right to cancel your bid if you have any negative feedback that might prejudice your bid. We will contact the successful high bidder by email after the auction closes. You must respond by phone within twenty-four (24) hours to confirm your intention to buy. Winning bidders must respond to us by telephone within 24 hours of auction closure to confirm your purchase or the vehicle may be re-listed or sold to any other qualified buyer. We are a full-service retail dealership; as such we reserve the right to end this auction at any time if the vehicle sells. We reserve the right to notify bidders and cancel this auction early. We shall not be held liable for any such cancellation. Please call before using the 'Buy it Now' option if featured to avoid confusion and to make sure this item is still available. The sale must be completed within five (5) days after the auction closes. All deliveries must be completed Monday through Saturday, 9 a.m. to 6 p.m. Central Standard Time. We may or may not have vehicle handbooks, floor mats or additional keys available for you (we generally do, please call to check). We will be happy to obtain floor mats and additional keys for you at minimal cost. Those wishing to have your vehicle shipped - all shipping charges are buyer's responsibility. Any claims arising from shipping or damage are between buyer and shipping company. Ad created by eCarList.com. Call 214-722-8200 to find out how eCarList can service your dealership. Photo Viewer 1996 Bentley Brooklands VIEW OTHER AUCTIONS ASK SELLER QUESTION Vital Information Year Make Model Mileage Engine 1996 Bentley Brooklands 64,150 Exterior Interior Stock# VIN Magnolia Tan #7350 SCBZE11C0TCX57350 view window sticker Carfax Highlights View Carfax Report Not all accidents or other issues are reported to CARFAX. The number of owners is estimated. See the full CARFAX Report for additional information and glossary of terms. 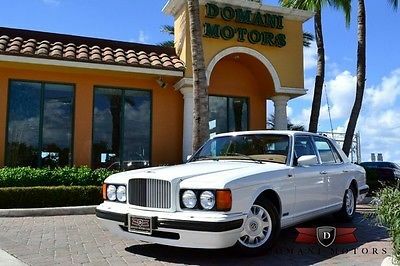 Carfax Highlights No Accidents / Damage Reported to CARFAXNo Airbag Deployment Reported to CARFAXVehicle Qualifies for the CARFAX Buyback GuaranteeNo Structural/Frame Damage Reported to CARFAXNo Manufacturer Recalls Reported to CARFAXNo Indication of an Odometer Rollback3 OwnersNo Total Loss Reported to CARFAX View All Photos Description 1996 Bentley Brooklands 1996 Bentley Brooklands Sedan only 64,150 miles The Bentley Brooklands was introduced in 1992 as a replacement for the Bentley Mulsanne and Bentley Eight models. The Brooklands continued Bentley's relatively angular design theme, which was also used on contemporary Rolls-Royce vehicles, throughout the 1980s and early 1990s. 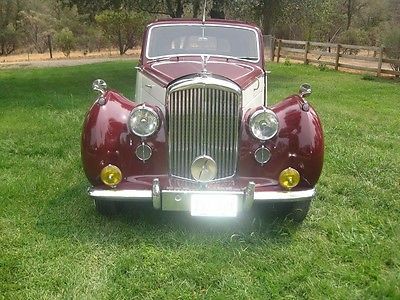 The exterior design featured the classic Bentley waterfall grille as well as dual headlights with wraparound parking lights. As in many Bentley and Rolls-Royce vehicles, the Brooklands also featured the trademark descending bootlid and chrome B-pillars. 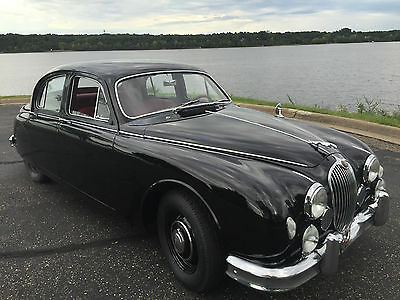 The interior remained relatively unchanged from previous Bentley models, with more curvaceous design elements surrounding the leather-wrapped center console. The interior continued to be surrounded by ample woodgrain which featured engraved, lighter-colored outlines on the door panels. The Brooklands MSRP started at around $156,500 Domani Motor Cars is located in Deerfield Beach, FL. Family owned and operated for over 35 years, we thank you for considering our vehicle and invite you to come in, call, or email our experts and experience the Domani Motor Cars difference! Domani Motor Cars - 866-666-3362 - info@domanimotors.com Contact Us Dealer Contact Domani Motors Internet Sales info@domanimotors.com 866-666-3362 Carfax Secure Online Credit Application Applying for a vehicle loan online is one of the quickest and easiest application methods. Our secure online application form is easy to complete, all you need are a few personal and employment details. Get started now. Below are a few of the other vehicles currently available from Domani Motors About Domani Motors Located in sunny south Florida, Domani Motor Cars is a high end exotic, luxury and sports car dealer that has been in business for over 30 years. Founded by Michael and Darlene Ghanem in 1986, Domani Motor Cars has grown to become one of the largest and most respected exotic automobile operations the world. We specialize in brands such as Ferrari, Lamborghini, Bentley, Rolls-Royce, Audi, Porsche, BMW, Bugatti, Maybach, Aston Martin, Maserati, Spyker, Land Rover, and Mercedes-Benz. Known for our unique, independent approach to business and professional service, we are committed to providing our clients with the highest level of customer satisfaction possible! With many finance and lease options at our disposal, our ultimate goal is to put you in the exotic automobile of your dreams! Each and every pristine vehicle in our showroom is hand selected by our owners, based on the highest criteria of quality and distinction. Only the finest examples to be found make it to our showroom! Domani Motor Cars is conveniently located in Deerfield Beach, Florida just one mile east of I-95 at Exit 41. We are open Monday through Friday from 9am to 7pm, Saturdays from 10am to 3pm, or by appointment anytime! Our team at Domani Motor Cars is here to serve you, so please stop by our lovely showroom, call, or email us today.Best wishes and we look forward to doing business with you soon! Domani Motor Cars . 70 SW 10th Street . Deerfield Beach . FL . 33441 . (866) 666-3362 (954) 428-5636 Ad created by eCarList.com. Call 214-722-8200 to find out how eCarList can service your dealership. Photo Viewer 1999 Bentley Azure VIEW OTHER AUCTIONS ASK SELLER QUESTION Vital Information Year Make Model Mileage Engine 1999 Bentley Azure 16,059 Exterior Interior Stock# VIN White White #1833 SCBZK25E7XCX61833 view window sticker Carfax Highlights View Carfax Report Not all accidents or other issues are reported to CARFAX. The number of owners is estimated. See the full CARFAX Report for additional information and glossary of terms. Carfax Highlights No Accidents / Damage Reported to CARFAXNo Airbag Deployment Reported to CARFAXVehicle Qualifies for the CARFAX Buyback GuaranteeNo Structural/Frame Damage Reported to CARFAXNo Manufacturer Recalls Reported to CARFAXNo Indication of an Odometer Rollback3 OwnersNo Total Loss Reported to CARFAX View All Photos Description 1999 Bentley Azure Domani Motor Cars is proud to present this RARE and gorgeous 1999 Bentley Azure. Finished in White over White hides with a Blue Convertible Top, with only 16,059 well maintained miles and just 1 of 141 Azures produced in 1999, this is sure to be a great collectible, the Azure is in amazing condition inside and out! If you are looking for a RARE and special Bentley Azure in an great color combination, search no more! This is the perfect Bentley FOR YOU! Call us on this beauty today! Family owned and operated for over 30 years, we thank you for considering our vehicle and invite you to come in, call, or email our experts and experience the Domani Motors difference! Domani Motor Cars - 866-666-3362 - info@domanimotors.com Contact Us Dealer Contact Domani Motors Internet Sales info@domanimotors.com 866-666-3362 Carfax Secure Online Credit Application Applying for a vehicle loan online is one of the quickest and easiest application methods. Our secure online application form is easy to complete, all you need are a few personal and employment details. Get started now. Below are a few of the other vehicles currently available from Domani Motors About Domani Motors Located in sunny south Florida, Domani Motor Cars is a high end exotic, luxury and sports car dealer that has been in business for over 30 years. Founded by Michael Ghanem in 1986, Domani Motor Cars has grown to become one of the largest and most respected exotic automobile operations the world. We specialize in brands such as Ferrari, Lamborghini, Bentley, Rolls-Royce, Audi, Porsche, BMW, Bugatti, Maybach, Aston Martin, Maserati, Spyker, Land Rover, and Mercedes-Benz. Known for our unique, independent approach to business and professional service, we are committed to providing our clients with the highest level of customer satisfaction possible! With many finance and lease options at our disposal, our ultimate goal is to put you in the exotic automobile of your dreams! Each and every pristine vehicle in our showroom is hand selected by our owners, based on the highest criteria of quality and distinction. Only the finest examples to be found make it to our showroom! Domani Motor Cars is conveniently located in Deerfield Beach, Florida just one mile east of I-95 at Exit 41. We are open Monday through Friday from 9am to 7pm, Saturdays from 10am to 3pm, or by appointment anytime! Our team at Domani Motor Cars is here to serve you, so please stop by our lovely showroom, call, or email us today.Best wishes and we look forward to doing business with you soon! Domani Motor Cars . 70 SW 10th Street . Deerfield Beach . FL . 33441 . (866) 666-3362 (954) 428-5636 Ad created by eCarList.com. Call 214-722-8200 to find out how eCarList can service your dealership. Rik Hambright (855) 235-9402 3900 Southwest Freeway Houston Texas 77027 ? ? ? ? 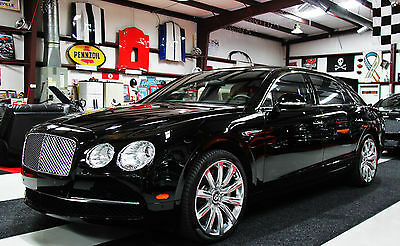 2013 Bentley Continental Flying Spur ? ? ? ? 1 of 30 ? View Large Images ? ? Vehicle Information VIN: SCBBR9ZA7DC078703 Stock: DC078703 Mileage: 36,457 Color: Light Havana Metallic Trans: Automatic Engine: 6L 12 Cylinder Engine Turbocharged MPG: Drivetrain: All Wheel Drive ?Credit Application ?Directions to Dealer ?Contact Us Why Buy From Us? Our pre-owned vehicles are backed by a 3-day, 150-mile Money-Back Guarantee. If for whatever reason you decide to return your vehicle, we’ll refund your money, no questions asked. It is just the peace-of-mind you would expect from America’s Largest Automotive Retailer. Description BRITISH RACING GREEN 4 METALLIC,Leather Seats,Sun/Moonroof,Navigation System,Cooled Front Seat(s),All Wheel Drive This vehicle includes a Money-Back Guarantee and passed our precise inspection process. Best of all the price you see is the price you pay. No haggling. No back and forth. No pressure. And this price is so good it is guaranteed. Price and selection is why Mercedes Benz of Houston Greenway is the number ONE Certified Mercedes Benz Dealer in TEXAS! Mercedes Benz of Houston Greenway is proud to offer this particular vehicle to you and we thank you for your consideration. We strive to be the best at what we do with the best of intentions. This vehicle has gone through our stringent safety inspection along with quality inspections. Come stop by our showroom at 3900 Southwest Fwy between Weslayan and Buffalo Speedway and experience a whole new luxury experience! We have the largest selection of Certified Pre-owned Mercedes Benz product here at our premier Houston showroom. Quality and prestige abound with this Bentley Continental Flying Spur. Enjoy driving? Well now you will get more thrills behind the wheel thanks to the heightened performance of AWD. Better handling. Better traction. Better driving experience. A Bentley with as few miles as this one is a rare find. This Bentley Continental Flying Spur was gently driven and it shows. More information about the 2013 Bentley Continental Flying Spur: The Continental is one of the fastest and most lavish prestige-luxury coupes available. With more comfort and luxury than the Aston Martin DB9 and Maserati GranTurismo yet a more exclusive look and feel than the BMW M6 or Mercedes0Benz CL63 AMG, the Continental GT models are good choices for those who want to stand out, yet be cosseted in the way that few luxury cars allow. While the Continental's form is distinctive in both coupe and sedan forms, this is a car that really shines inside, with excellent front seats, an array of luxury features that's up to snuff with any German technology flagship and the far more exclusive, individualized appointments of a high-prestige coupe--and a seemingly endless list of possible materials like hand-stitched seats, special embroidery, grain-matched real wood veneers, and custom colors. Inside or out, it's unlikely you'll see two exactly the same. For those looking for top-down thrills in a prestige-luxury presentation, the Continental GTC provides all the features, performance and exclusive pedigree of the coupe but with a power-folding, multi-layered soft top that seals out the elements when the sun's not out. Furthermore, the Continental, in in all of its variants, features surprising normal drivability characteristics--unlike some supercars or ultra-luxury models that may be cramped, lack visibility, be difficult to drive in traffic and park. Strengths of this model include Relaxed yet very strong powertrains, smooth ride yet responsive handling, quiet, tight cabin, coupe and sedan body styles available, hand-crafter interior materials, and more fuel-efficient V8 model Some used vehicles may have unrepaired safety s. You can check status by VIN at https://www.safercar.gov Options Options ? Light Havana Metallic ? Leather Seats ? Sun/Moonroof ? Navigation System ? Cooled Front Seat(S) ? All Wheel Drive Standard Features Basic Information Stock Number: DC078703 VIN Number: SCBBR9ZA7DC078703 Make: Bentley Model: Continental Flying Spur Model Year: 2013 Vehicle Type: 4Dr Car Interior Color: TAN Exterior Color: Light Havana Metallic Body Type: Sedan Engine Compressor: Twin Turbo Engine Description: 6L 12 Cylinder Engine Turbocharged Fuel Type: Ethanol - FFV Fuel Induction: Sequential MPI Valves Per Cylinder: 4 Aspiration: Twin-Turbocharged DriveTrain 4WD Type : Automatic Full-Time Driven Wheels: All-Wheel Drive Locking Hubs: Permanent Transmission: Automatic Wheels Rims: Silver Aluminum Wheels Spare Rim Type: Steel Drive Train Type: All Wheel Drive Suspension Active Suspension Independent Suspension: Four-Wheel Leveling Suspension: 4-Corner Stabilizer Bar: Front And Rear Instrumentation Clock Compass External Temp Low Fuel Level Tachometer Trip Computer Roof and Glass Front Wipers: Variable Intermittent Privacy Glass: Light Rear Defogger Sunroof: Express Open/Close Glass In Car Entertainment Antenna Type: Window Grid Audio System: Sirius AM/FM/Satellite Speakers: 12 Seats Drivers: Multi-Level Heating Drivers Height: Power Drivers Lumbar: Massaging Drivers Power: 10 Passenger: Multi-Level Heating Passenger Height: Power Passenger Lumbar: Massaging Passenger Power: 10 Seating Capacity: 5 Front Seat Type: Bucket Upholstery: Leather Center Armrest: With Pass-Thru Heated Lumbar: Massaging Convenience Center Console: Full With Covered Storage Cruise Control Cupholders: Front And Rear Door Pockets: Driver, Passenger And Rear Overhead Console: Mini Power Outlets: 2 Remote Trunk Release: Power Seatback Storage: 2 Steering Adjustment: Tilt And Telescopic Steering Power: Speed-Proportional Power Steering Universal Remote Transmitter Auto Dimming Mirrors: Electrochromatic Power Mirrors: Power Remote Power Retractable Mirrors Power Door Locks Windows: Power Windows Navigation System Memory Features Exterior Mirrors Memory Features Number of Drivers: 3 Memory Features Steering Wheel Comfort Air Conditioning: Automatic Air Filtration: Interior Air Filtration Trunk Lights: Cargo Area Light Center Console Trim: Aluminum/Genuine Wood Dash Trim: Genuine Wood Door Trim: Aluminum/Genuine Wood Reading Lights: Front And Rear Shift Knob: Leather/Chrome Vanity Mirrors: Dual Illuminated Vanity Mirrors Features Bumpers: Body-Colored Door Reinforcement: Side-Impact Door Beam Safety Turning Circle: 38.8 ABS: 4-Wheel Head Airbags: Curtain 1St And 2Nd Row Anti Theft System Brake Assist: Braking Assist Engine Immobilizer Headlights Dusksensor: Dusk Sensing Front Headrests: Power Adjustable Rear Headrests: 2 Rear Center Seatbelt: 3-Point Belt Safety Signal Mirrors: Turn Signal In Mirrors Safety Stability Control Driver and Passenger Airbag Side Airbag Stability Control Door Reinforcement: Side-Impact Door Beam Towing and Hauling Tie Downs: Cargo Tie Downs Doors Rear Door Type: Power Open And Close Trunk Side Door Type: Conventional Dimensions Front Head Room: 36.8 Inches Front Hip Room: 61.6 Inches Front Shoulder Room: 61.6 Inches Front Leg Room: 41.5 Inches Rear Head Room: 37.8 Inches Rear Hip Room: 60.4 Inches Rear Leg Room: 38.6 Inches Rear Shoulder Room: 60.4 Inches Luggage Capacity: 17 Cu.Ft. Length: 208.3 Inches Width: 77.8 Inches Wheelbase: 120.7 Inches Max Gross Vehicle Weight: 6,482 Lbs. Curb Weight: 5,456 Lbs. Contact Mercedes-Benz of Houston Greenway 3900 Southwest Freeway Houston Texas 77027 View Map Ask for:Rik Hambright Contact: ?Contact Us Phone:(855) 235-9402 Hours Mon-Sat:09:00am-07:00pm CST Sunday:Closed x50 156k window sticker CARFAX Vehicle History Report VEHICLE HISTORY REPORTS Dont buy a used car without CARFAX! View Free History Report Disclaimer: Not all accidents or other issues are reported to CARFAX. The number of owners is estimated. See the full CARFAX Report for additional information and glossary of terms. ? Apply Now Secure Credit Application Applying for a vehicle loan online is one of the quickest and easiest application methods. Our secure application is easy to complete, all you need are a few personal and employment details. About Us Terms Placing a Bid: Your bid constitutes a legally binding contract to purchase this vehicle. Please do not bid if you're not seriously interested or financially able to purchase this vehicle. Please read eBay's User Agreement Mercedes-Benz of Houston Greenway reserves the right to, Obtain and verify the registered information of all users who bid on this auction. Cancel any and all bids at our discretion, or end the auction early if necessary. Bidders Age: You must be 18 years of age or older to Bid. Special eBay Bid Retraction Rules: Please read eBay's "Retracting a Bid" If you place a bid before the last 12-hour period of the auction: You may retract that bid before that last 12-hour period but only for exceptional circumstances. You will not be allowed to retract that bid during the last 12-hour period of the auction. If you place a bid during the last 12-hour period of the auction: You will be allowed to retract the bid for exceptional circumstances but only if you do so within one hour after placing the bid. Funds & Financing: For help in arranging for a Pre-Approved loan or for any questions please e-mail or phone Rik at (855) 235-9402 prior to bidding. Buyers Inspection: Mercedes-Benz of Houston Greenway has done our best to disclose all information known about this vehicle for auction. Mercedes-Benz of Houston Greenway welcomes a buyers inspection. If you plan to have a buyers inspection, please make sure you inspect the vehicle prior to the auction ending. Inspection fees if any are Buyers responsibility. Representations and Warranties made by seller: This vehicle is being sold "as is". Manufacturers warranties may still apply. Extended warranty may be available, e-mail or phone Rik at (855) 235-9402 for details. No representations or warranties are made by seller, nor are any representations or warranties relied upon by bidders in making bids. Taxes and Registration fees: Out of state buyers are responsible for all state, county, city taxes and fees, as well as title service fees in the state that the vehicle will be registered. All taxes and fees must be paid in full in order for vehicle to be titled and registered. Title Information: Vehicles titles may be held by banks or lenders as collateral for loans. In many cases there is a delay in receiving the original instruments up to 21 days from the time we pay a vehicle off. While we usually have all titles in our possession at closing, there are occasions where we may be waiting for them to arrive. If payment is made by cashier's or personal checks we will hold all titles for 10 days or until funds have cleared. Shipping & Delivery: All shipping charges are buyer's responsibility. Mercedes-Benz of Houston Greenway will help with shipping arrangements but will not be responsible in any way for claims arising from shipping damage! Licensed Carriers are generally insured for $3,000,000.00. We assume no responsibility for damages incurred after the vehicle leaves our showroom. All shipping arrangements are provided by Mercedes-Benz of Houston Greenway as a courtesy. We are not affiliated with any carrier. Any claims or other communication regarding shipment of vehicles will be between you and the shipper, not with Mercedes-Benz of Houston Greenway. The amount of time it takes for delivery is dependent on the carrier, but is generally 7-14 days from the date the vehicle is picked up from our facility until it is delivered to your destination. Verify with the shipper for an Estimate Time of Arrival to be sure. Finalizing your Purchase: Mercedes-Benz of Houston Greenway will contact the successful high bidder by e-mail after the auction closes. Successful high bidder MUST communicate with Rik at Mercedes-Benz of Houston Greenway by e-mail or phone (855) 235-9402 within 24 hours of the auction ending to make arrangements to complete their transaction. If we cannot confirm your intention to buy or the sale is not completed within 5 days, we reserve the right to relist this vehicle or sell to any other qualified buyer. In order to secure bid on vehicle, Successful bidder (BUYER) must within 24 hours of bid closing send to Seller a Deposit in the amount of $500.00 by major credit card, cash in person or bank certified funds. Within 72 hours of bid closing, Buyer must send balance of funds by cash in person or bank certified funds to Seller. At time of sending initial deposit, Buyer MUST fax copy of their State issued valid Driver License. Furthermore, before said vehicle is released for shipment to Buyer, all other Sale related and title related paperwork must be signed and returned complete to Seller. Disclaimers Accessories & color may vary. Dealer not responsible for errors or omissions. New vehicle pricing may already include applicable manufacturer incentives which may expire at any time & are subject to incentive qualification criteria & requirements. Manufacturer incentive data & vehicle features is provided by third parties & believed to be accurate as of the time of publication. Please contact the store by email or phone for details & availability of incentives. Sales tax or other taxes, tag, title, registration fees, government fees, not included. Dealer Documentary Fee not included in quoted price. Some used vehicles may have unrepaired safety recalls. You can check recall status by VIN, at www.safercar.gov. Money Back Guarantee, 3 days or 150 miles, whichever comes first. Subject to certain terms & conditions. See store for details. Some restrictions apply. Copyright © 2017 Auction123 - All rights reserved. - Disclaimer +- Auction123 (a service and listing/software company) and the Seller has done his/her best to disclose the equipment/condition of this vehicle/purchase. However, Auction123 disclaims any warranty as to the accuracy or to the working condition of the vehicle/equipment listed. The purchaser or prospective purchaser should verify with the Seller the accuracy of all the information listed within this ad. Selling a Vehicle? Create Professional Listings Fast and Easy. Click Here! Rik Hambright (855) 235-9402 3900 Southwest Freeway Houston Texas 77027 ? ? ? ? 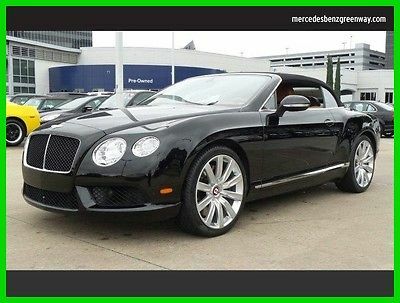 2014 Bentley Continental GTC V8 ? ? ? ? 1 of 30 ? View Large Images ? ? Vehicle Information VIN: SCBGT3ZA8EC094379 Stock: EC094379 Mileage: 4,300 Color: Black Velvet Metallic Trans: Automatic Engine: 4L 8 Cylinder Engine Turbocharged MPG: 14 City / 24 Highway Drivetrain: All Wheel Drive ?Credit Application ?Directions to Dealer ?Contact Us Why Buy From Us? Our pre-owned vehicles are backed by a 3-day, 150-mile Money-Back Guarantee. If for whatever reason you decide to return your vehicle, we’ll refund your money, no questions asked. It is just the peace-of-mind you would expect from America’s Largest Automotive Retailer. Description Leather Seats,Navigation System,All Wheel Drive,BLACK VELVET METALLIC,SADDLE; LEATHER BUCKET SEATS This vehicle includes a Money-Back Guarantee and passed our precise inspection process. Best of all the price you see is the price you pay. No haggling. No back and forth. No pressure. And this price is so good it is guaranteed. Price and selection is why Mercedes Benz of Houston Greenway is the number ONE Certified Mercedes Benz Dealer in TEXAS! Mercedes Benz of Houston Greenway is proud to offer this particular vehicle to you and we thank you for your consideration. We strive to be the best at what we do with the best of intentions. This vehicle has gone through our stringent safety inspection along with quality inspections. Come stop by our showroom at 3900 Southwest Fwy between Weslayan and Buffalo Speedway and experience a whole new luxury experience! We have the largest selection of Certified Pre-owned Mercedes Benz product here at our premier Houston showroom. This vehicle is loaded with great features, plus it comes with the CARFAX BuyBack Guarantee. 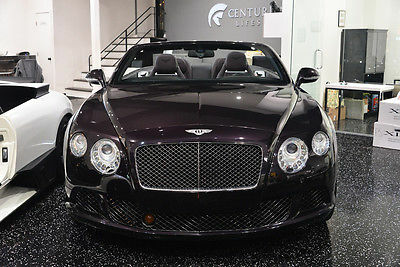 If you're a driving enthusiast, you'll be grateful for the chance to drive this Bentley Continental GT V8 convertible. You'll discover what millions of convertible owners have known for years -- nothing beats an open air experience. You appreciate the finer things in life, the vehicle you drive should not be the exception. 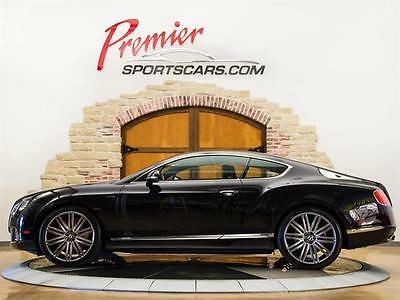 Style, performance, sophistication is in a class of its own with this stunning Bentley Continental GT V8. Enhanced performance, a refined interior and exceptional fuel economy are just a few of the things you'll enjoy about this all-wheel drive vehicle. More information about the 2014 Bentley Continental GT V8: The Bentley Continental is part personal luxury coupe, part performance-oriented grand-tourer--and the specific combination of those traits depends largely on whether one opts for GT models or the edgier GT Speed. Bentleys are built to specification, with a long list of factory options, upgrades and trims, in addition to a bespoke program that lets buyers entirely customize the look, the only limit, is imagination, taste and budget. Regardless of materials or trims, the level of detail and craftsmanship is well above that of most other luxury cars. This model sets itself apart with Supercar-quick, no compromises to comfort, reasonable gas mileage (V8 models), all-weather traction, pleasant top-down in optional convertible, and hand-crafted look of interior trims Some used vehicles may have unrepaired safety s. You can check status by VIN at https://www.safercar.gov Options Options ? All Wheel Drive ? Black Velvet Metallic ? Leather Seats ? Navigation System ? Saddle; Leather Bucket Seats Standard Features Basic Information Stock Number: EC094379 VIN Number: SCBGT3ZA8EC094379 Make: Bentley Model: Continental GTC Model Year: 2014 Vehicle Type: 2Dr Car Interior Color: Saddle Exterior Color: Black Velvet Metallic Body Type: Convertible Engine Compressor: Twin Turbo MPG Automatic City: 14 MPG Automatic Highway: 24 Engine Description: 4L 8 Cylinder Engine Turbocharged Fuel Type: Gas Fuel Induction: Direct Gasoline Injection Valves Per Cylinder: 4 Aspiration: Twin-Turbocharged DriveTrain 4WD Type: Automatic Full-Time Driven Wheels: All-Wheel Drive Locking Hubs: Permanent Transmission: Automatic Wheels Rims: Silver Aluminum Drive Train Type: All Wheel Drive Suspension Active Suspension Independent Suspension: Four-Wheel Leveling Suspension: 4-Corner Stabilizer Bar: Front And Rear Instrumentation Clock Compass External Temp Low Fuel Level Tachometer Trip Computer Roof and Glass Convertible Roof: Power Convertible Window: Glass Rear Window Front Wipers: Variable Intermittent Privacy Glass: Light Rear Defogger In Car Entertainment Antenna Type: Concealed Audio System: Sirius AM/FM/Satellite Seats Drivers: Multi-Level Heating Drivers Height: Power Drivers Lumbar: Power 4-Way Drivers Power: 10 Passenger: Multi-Level Heating Passenger Height: Power Passenger Lumbar: Power 4-Way Passenger Power: 8 Seating Capacity: 4 Front Seat Type: Bucket Upholstery: Leather Convenience Center Console: Full With Covered Storage Cruise Control Cupholders: Front Door Pockets: Driver And Passenger Overhead Console: Mini Power Outlets: 3 Remote Trunk Release: Power Steering Adjustment: Tilt And Telescopic Steering Power: Speed-Proportional Power Steering Universal Remote Transmitter Auto Dimming Mirrors: Electrochromatic Power Retractable Mirrors Power Door Locks Windows: Power Windows Navigation System: With Voice Activation Memory Features Exterior Mirrors Memory Features Number Of Drivers: 3 Memory Features Steering Wheel Comfort Air Conditioning: Automatic Air Filtration: Interior Air Filtration Trunk Lights: Cargo Area Light Door Trim: Aluminum Reading Lights: Front Steering Wheel Trim: Leather Vanity Mirrors: Dual Illuminated Vanity Mirrors Features Bumpers: Body-Colored Door Reinforcement: Side-Impact Door Beam Safety Turning Circle: 37.6 ABS: 4-Wheel Anti Theft System Brake Assist: Braking Assist Daytime Running Light Engine Immobilizer Headlights Auto Delay: Auto Delay Off Headlights Dusksensor: Dusk Sensing Front Headrests: Fixed Rear Headrests: 2 Safety Signal Mirrors: Turn Signal In Mirrors Safety Stability Control Driver And Passenger Airbag Side Airbag Stability Control Door Reinforcement: Side-Impact Door Beam Towing and Hauling Tie Downs: Cargo Tie Downs Doors Rear Door Type: Trunk Dimensions Luggage Capacity: 7 Cu.Ft. Length: 189.1 Inches Width: 76.5 Inches Height: 55.2 Inches Wheelbase: 108.1 Inches Max Gross Vehicle Weight: 6,393 Lbs. Curb Weight: 5,445 Lbs. Contact Mercedes-Benz of Houston Greenway 3900 Southwest Freeway Houston Texas 77027 View Map Ask for:Rik Hambright Contact: ?Contact Us Phone:(855) 235-9402 Hours Mon-Sat:09:00am-07:00pm CST Sunday:Closed x50 156k window sticker CARFAX Vehicle History Report VEHICLE HISTORY REPORTS Dont buy a used car without CARFAX! View Free History Report Disclaimer: Not all accidents or other issues are reported to CARFAX. The number of owners is estimated. See the full CARFAX Report for additional information and glossary of terms. ? Apply Now Secure Credit Application Applying for a vehicle loan online is one of the quickest and easiest application methods. Our secure application is easy to complete, all you need are a few personal and employment details. About Us Terms Placing a Bid: Your bid constitutes a legally binding contract to purchase this vehicle. Please do not bid if you're not seriously interested or financially able to purchase this vehicle. Please read eBay's User Agreement Mercedes-Benz of Houston Greenway reserves the right to, Obtain and verify the registered information of all users who bid on this auction. Cancel any and all bids at our discretion, or end the auction early if necessary. Bidders Age: You must be 18 years of age or older to Bid. Special eBay Bid Retraction Rules: Please read eBay's "Retracting a Bid" If you place a bid before the last 12-hour period of the auction: You may retract that bid before that last 12-hour period but only for exceptional circumstances. You will not be allowed to retract that bid during the last 12-hour period of the auction. If you place a bid during the last 12-hour period of the auction: You will be allowed to retract the bid for exceptional circumstances but only if you do so within one hour after placing the bid. Funds & Financing: For help in arranging for a Pre-Approved loan or for any questions please e-mail or phone Rik at (855) 235-9402 prior to bidding. Buyers Inspection: Mercedes-Benz of Houston Greenway has done our best to disclose all information known about this vehicle for auction. Mercedes-Benz of Houston Greenway welcomes a buyers inspection. If you plan to have a buyers inspection, please make sure you inspect the vehicle prior to the auction ending. Inspection fees if any are Buyers responsibility. Representations and Warranties made by seller: This vehicle is being sold "as is". Manufacturers warranties may still apply. Extended warranty may be available, e-mail or phone Rik at (855) 235-9402 for details. No representations or warranties are made by seller, nor are any representations or warranties relied upon by bidders in making bids. Taxes and Registration fees: Out of state buyers are responsible for all state, county, city taxes and fees, as well as title service fees in the state that the vehicle will be registered. All taxes and fees must be paid in full in order for vehicle to be titled and registered. Title Information: Vehicles titles may be held by banks or lenders as collateral for loans. In many cases there is a delay in receiving the original instruments up to 21 days from the time we pay a vehicle off. While we usually have all titles in our possession at closing, there are occasions where we may be waiting for them to arrive. If payment is made by cashier's or personal checks we will hold all titles for 10 days or until funds have cleared. Shipping & Delivery: All shipping charges are buyer's responsibility. Mercedes-Benz of Houston Greenway will help with shipping arrangements but will not be responsible in any way for claims arising from shipping damage! Licensed Carriers are generally insured for $3,000,000.00. We assume no responsibility for damages incurred after the vehicle leaves our showroom. All shipping arrangements are provided by Mercedes-Benz of Houston Greenway as a courtesy. We are not affiliated with any carrier. Any claims or other communication regarding shipment of vehicles will be between you and the shipper, not with Mercedes-Benz of Houston Greenway. The amount of time it takes for delivery is dependent on the carrier, but is generally 7-14 days from the date the vehicle is picked up from our facility until it is delivered to your destination. Verify with the shipper for an Estimate Time of Arrival to be sure. Finalizing your Purchase: Mercedes-Benz of Houston Greenway will contact the successful high bidder by e-mail after the auction closes. Successful high bidder MUST communicate with Rik at Mercedes-Benz of Houston Greenway by e-mail or phone (855) 235-9402 within 24 hours of the auction ending to make arrangements to complete their transaction. If we cannot confirm your intention to buy or the sale is not completed within 5 days, we reserve the right to relist this vehicle or sell to any other qualified buyer. In order to secure bid on vehicle, Successful bidder (BUYER) must within 24 hours of bid closing send to Seller a Deposit in the amount of $500.00 by major credit card, cash in person or bank certified funds. Within 72 hours of bid closing, Buyer must send balance of funds by cash in person or bank certified funds to Seller. At time of sending initial deposit, Buyer MUST fax copy of their State issued valid Driver License. Furthermore, before said vehicle is released for shipment to Buyer, all other Sale related and title related paperwork must be signed and returned complete to Seller. Disclaimers Accessories & color may vary. Dealer not responsible for errors or omissions. New vehicle pricing may already include applicable manufacturer incentives which may expire at any time & are subject to incentive qualification criteria & requirements. Manufacturer incentive data & vehicle features is provided by third parties & believed to be accurate as of the time of publication. Please contact the store by email or phone for details & availability of incentives. Sales tax or other taxes, tag, title, registration fees, government fees, not included. Dealer Documentary Fee not included in quoted price. Some used vehicles may have unrepaired safety recalls. You can check recall status by VIN, at www.safercar.gov. Money Back Guarantee, 3 days or 150 miles, whichever comes first. Subject to certain terms & conditions. See store for details. Some restrictions apply. Copyright © 2017 Auction123 - All rights reserved. - Disclaimer +- Auction123 (a service and listing/software company) and the Seller has done his/her best to disclose the equipment/condition of this vehicle/purchase. However, Auction123 disclaims any warranty as to the accuracy or to the working condition of the vehicle/equipment listed. The purchaser or prospective purchaser should verify with the Seller the accuracy of all the information listed within this ad. Selling a Vehicle? Create Professional Listings Fast and Easy. Click Here! 2014 Bentley Flying Spur VIN # SCBEC9ZA2EC092153 3,900 Miles 6.0l Twin Turbocharged W12 Engine 8-Speed Automatic All Wheel Drive Beluga Black Exterior Saffron Leather Interior with Factory Bentley Logo in Headrest Speed Sensitive Power Steering Keyless Entry and Ignition Power Open and Close Boot System Dash Mounted Clock by Breitling Electrically Operated Blinds for Rear Windows Multi Zone Automatic Climate Control 14 Way Power Driver and Passenger Seats Heated and Cooled Seats Ride Control and Height Driver Adjustable Suspension Hands-Free Communication System Single Cd/Dvd in-Dash Cd Mp3 Playback Mp3 Player with Voice Recognition Navigation System Bluetooth Telephone System Satellite Radio Rain Sensing Front Wipers 21” Two Piece 5-Spoke Polished Alloy Wheels Heated Single Tone, 3 Spoke Hide Trimmed Steering Wheel Veneered Picnic Tables Contrast Stitching Chrome Inlay to Door Waist Rails Rear View Camera Storage Case and Center Console Deep Pile Carpet Overmats Steering Column Mounted Gear Selectors Contrast Binding Overmats Stitching To Steering Wheel In Contrast Colour I Have Both Keys, Books, And Window Sticker This Bentley is 100% Clean CarFax, No Stories You Must See This Bentley to Truly Appreciate Just How Perfect it is. If you have any questions feel free to contact, Brent at (352)-302-1583 I will be more then happy to arrange for shipping or arrange for VIP pick-up from the airport. International buyers are welcome with prior approval. $1,000 deposit required VIA Credit Card within 24 hours. After full purchase price payment has been made your deposit will be quickly refunded back to your Credit Card or May be applied towards the items cost. We have Financing Available Thank You For Your Interest & Good Luck Bidding! BRENT Also, Be Sure To Check Out My other items & Cars By Clicking! For questions regarding my other inventory below please contact me via phone or email, or message me through their listing page! $395.00 dealer fee applicable on all vehicle sales. Buyer is responsible for tax, tag, and title fees. We do not charge high fees like lots of other dealers. All items are subject to prior sale off ebay. Removal of sold items can take up to 24-48 business hours to cancel. In the event a sold item is purchased on ebay your paypal deposit will be promptly refunded or may be used to hold another vehicle. All sales are final, there are no refunds. Do not assume anything, if you have a question feel free to ask. By bidding/making an offer/using buy-it-now on the auction you agree to any and all terms expressed and/or implied. Thank you for your business, we very much appreciate it! 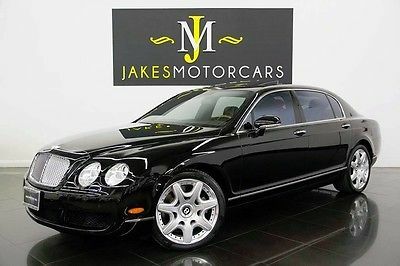 2008 Bentley Continental Flying Spur MULLINER 2008 CONTINENTAL FLYING SPUR, MULLINER PKG, BLACK ON BLACK, 68K MILES, SERVICED!